Built in the 16th century, Morelia is an outstanding example of urban planning which combines the ideas of the Spanish Renaissance with the Mesoamerican experience. Well-adapted to the slopes of the hill site, its streets still follow the original layout. More than 200 historic buildings, all in the region's characteristic pink stone, reflect the town's architectural history, revealing a masterly and eclectic blend of the medieval spirit with Renaissance, Baroque and neoclassical elements. 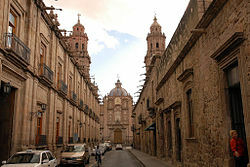 Morelia was the birthplace of several important personalities of independent Mexico and has played a major role in the country's history. This article uses material from UNESCO World Heritage List article "Historic Centre of Morelia", which is released under the Creative Commons Attribution-Share-Alike 3.0 IGO License.